Eucalyptus Towers Co-op is located in the beautiful city of Moreno Valley. 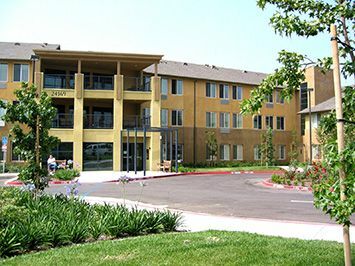 It is one of the newer co-ops in the California region, built in 2004. It is nestled amidst the chapparal landscape of the Inland Empire, which is soaked with sunshine, Palm trees and floral scented breezes. This three-story and 70-unit apartment has very spacious common balconies on the second and third floors looking over surrounding hills and mountains. Eucalyptus Towers Co-op Apartments does not allow smoking in any common areas, and within 25 feet of the building. There is an exercise room with lots of equipment for members’ use. Its large community room can be used for parties and different activities that can be organized by members. The grounds are park-like with rose gardens, walls of bougainvilleas and citrus trees ripe for the picking. Every corner of the building is filled with a welcoming atmosphere and you will feel right at home instantly. Members are excited about making Eucalyptus Towers the happiest place to live and they are determined to make it happen. Check into this wonderful community and be part of us! Eucalyptus Towers Co-op is proud to be recognized as a NAHMA Communities of Quality Corporate Partner. This designation is for multifamily properties that have achieved a high standard of excellence in the way they are managed, the services they provide residents, the experience and training of personnel, and other criteria.